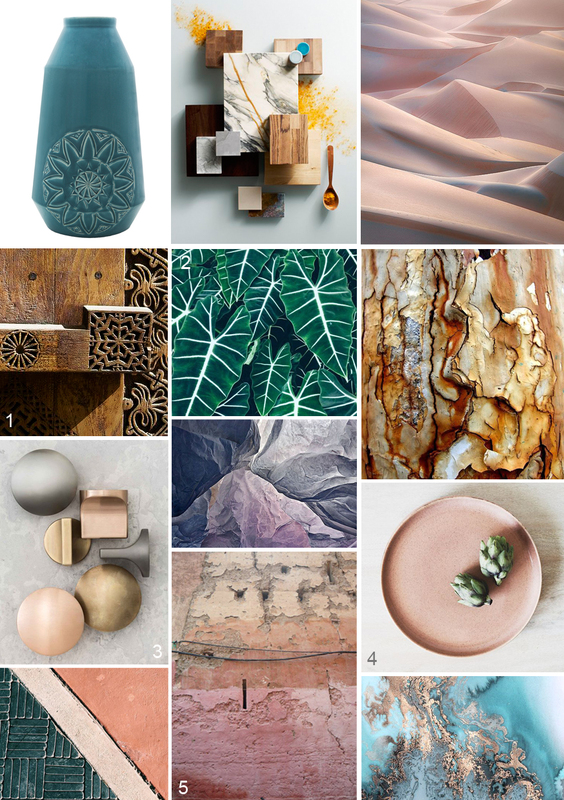 It is a moody Monday today, so time for a new moodboard! Today we will show you how you can combine our blue-green vase with a raw but colourful (vintage) interior. We also give some tips on colour, texture and material combinations. This vase is carved by hand, with an intricate pattern. It is nice to combine the vase with other patterned materials, for instance with carved wood (1) or wood with the bark still on it. The combination with plants with a particular pattern is also great! (2). A rough wall in subtle, powder colours (5) also make a strong combination. To make a contrast with the carved pattern you can combine this vase with smooth polished metals like brass, aluminium or copper. It looks great when these metals are frosted (3). The blue-green of the vase is an intense hue, which goes well with a lot of colours. Here we show you how lovely it is in combination with powder pink (4), emerald green, wood brown and a dash of golden yellow. You can also choose to combine the pink with grey-blue and old leather or wood. This combination of dark materials & light colours is very strong! (2). If you love wood, you can use it on your walls as well, layered in a pattern it looks so awesome! (5). Use plants to liven up your interior, big ones with distinctive leaves make a great eye catcher (4) in your interior. Combined with wood, blues & white it makes a fresh interior. Hope we gave you loads of inspiration. You can find more information about our vase here. We made some moodboards before; for our large stripes by Douwe vase & for our small triangles vase For our lamp 'large wicked light by esmé' you can also find a moodboard here. 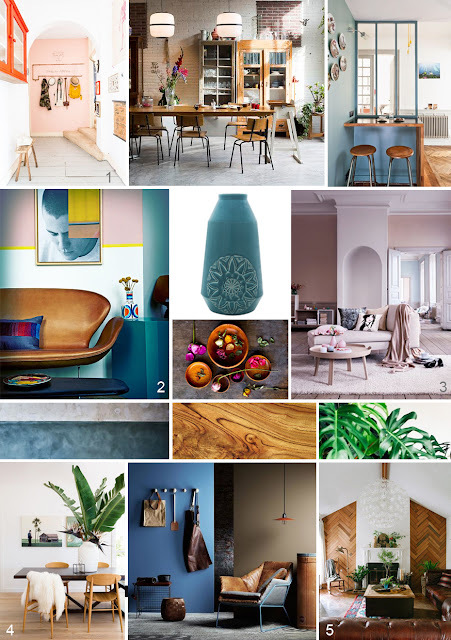 If you want more inspiration pictures of our products, check out our pinterest bord.